Carone Learning is joining the career education movement focusing on more prepared, capable, and proactive high school graduates. We believe with the right training and resources, this generation of students can become a powerful part of the American work force. Our Career Pathways curriculum plan prepares students with all the resources, skills, and knowledge they need to fast-track in the field of their choice. Whether students are exploring their options, looking for interesting elective credit, or they want to get a head start on the career of their choice, we have classes that will empower them to move forward. Our career pathway is divided into four tiers of progression. In Tier 1 classes, students explore different careers in the field of sports and fitness, gaining a greater understanding of the requirements, challenges and perks in each job. In Tier 2 and 3 classes, students obtain the foundational knowledge that they’ll need in the field, from nutrition and first aid to physiology. Tier 4 classes are specifically tailored for the student’s career of choice, so that they can start down the road to qualification and certification in careers such as personal training, coaching, and sports officiating. Exploring careers in the field of sports & fitness is exciting for a lot of students because it gives them the chance to pursue their passions and hobbies to the point of professional expertise. Since the field is growing, both domestically and abroad, there’s good job stability and a lot of opportunity for ambitious individuals to expand. People who work in sports & fitness fields get to enjoy an advantage that office workers will never experience: getting healthier on the job! Instead of straining your eyes at a desk job, you’ll be able to incorporate daily physical activity. Another fantastic benefit is that it gives employees the opportunity to work directly with a variety of people, both one on one and in groups. Most of all, sports & fitness professionals get to fulfill a higher purpose, because they’re empowering others to be healthy and active, a function that’s more and more important in our sedentary society. 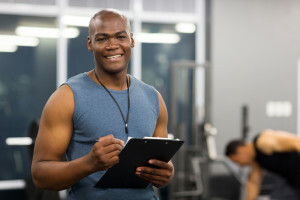 While classes that take place online may not seem, at first, like a natural setting for sports & fitness classes, the truth is that it’s the perfect fit! Many students who were ambivalent toward fitness topics find a newly-awakened passion for the subject in Carone’s online curriculum. Online learning fosters skills that are needed for career success in a way that no other format can. With online learning, students learn time management, goal-setting, and personal motivation—all traits that are important in a career setting. Self-directed learning is the perfect place for students to explore jobs that are of interest to them, and prepare at their own pace. To learn more about our classes, explore our course catalog, or give us a call.